If you are being wed in a church, you will be standing up on, or right in front of, the altar during the marriage ceremony. With all eyes looking that way, you will want to be sure that the altar is as beautifully decorated as the rest of your wedding. Here are some of the ways that you can make the altar picture perfect for your wedding ceremony. 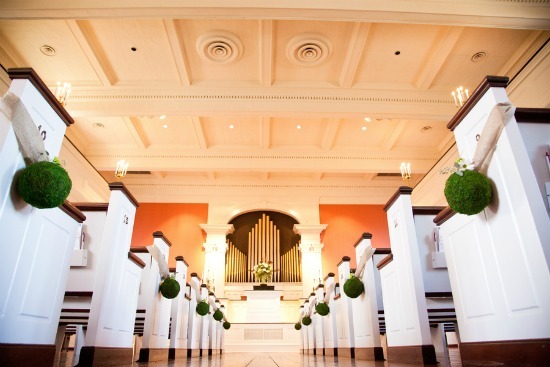 The first step when planning any type of church decorations is to speak to your officiant. Most churches will have regulations about what they will or will not permit you to do to the church, both inside and outside. You are likely to find that they do not want you to put any holes in the wall, and sprinkling the altar floor with flower petals is also probably not allowed. From there, some churches will allow you a great deal of flexibility, whereas others may permit only a bare minimum of decorating. If your wedding will fall near a holiday like Christmas or Easter, also be sure to find out what special decorations the church will have in place at that time. It may be that they are so lovely that you do not need to add anything else. In fact, this can be a very good reason to schedule your wedding at one of these times, as you can usually cut down on your decorating costs. It is also quite possible that the seasonal flowers and the like will have to remain in place during your wedding, so you will need to choose your other décor to coordinate. The altar area of a church is a large space to fill, so it is important to choose flowers and other elements that make a big impact. Remember that your guests will be seeing the decorations from distance. This is not the place to spend your money on special details like crystal drops in the floral arrangements to coordinate with your bridal jewelry. If you are planning on accents like that in your centerpieces and want to bring jewelry style accents to the ceremony décor, put them in your bridal bouquet. They will just get lost when view from far away. At the minimum, plan on having some tall floral displays flanking the altar, as well as a large accent further out to each side, such as a standing candelabra or a potted tree. If your church does not permit you to have open flame, one pretty idea would be to add battery powered white lights to a potted tree. The trees can be rented, and are an easy way to add a big splash of color without the expense of creating a massive floral arrangement. A contemporary version of this would be to "plant" white birch branches into a large container in lieu of greenery. Place uplighting in the base of each pot for a dramatic effect. 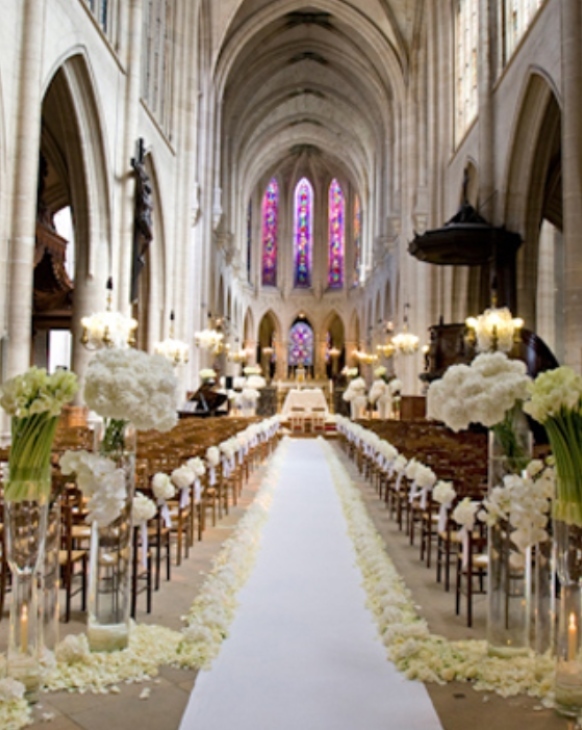 When choosing the flowers for the arrangements nearest the altar, look for ones that are tall and bold. They may not be the same types of blossoms that you use for your centerpieces, which is fine, as long as they are similar in style and color. Tall footed vases will also add height and impact. If your church allows it, a gorgeous idea is to drape a lush swag of greens and flowers on the altar table. This will look very pretty in the photographs behind you taken during the exchange of vows. Most altars are too large an area to fill with decorations, so don't drive yourself crazy trying to decorate every square inch. Simply choose a few large accents and position them where they will have the most impact. The special décor that you use for your wedding ceremony will make it even lovelier.